A Forklift in GTA San Andreas.. The Forklift is featured in multiple GTA games, including Grand Theft Auto: San Andreas, Grand Theft Auto: Vice City Stories, Grand Theft Auto IV and Grand Theft Auto V. Its features vary between games. The Forklift is a small, light electric-powered vehicle, to the point where it cannot sustain high velocity hits without being knocked over. Control can be a problem, due to its rear-wheel steering, short wheelbase and high center of gravity. While the lift is functional in the GTA San Andreas and GTA Vice City Stories rendition, there is no apparent way to raise or lower the lift in GTA IV; the lifts are also incapable of lifting cars as they will simply slide off the lift. Beginning the HD Universe, the GTA IV rendition of the Forklift houses a tank of what seems to be propane; shooting it will either cause it to leak ignited gas (illustrated with a visible jet of blue flame), or to itself ignite and eventually explode, taking the entire vehicle with it. Safety illustrations are printed on the vehicle, accompanied by the caption "YOU WILL DIE". GTA IV's Forklift is also available with any one of two minor variations of yellow body color. The Forklift returns in GTA V, remaining highly unaltered in design and performance. However, the lift is now operable like in San Andreas and Vice City Stories. GTA IV. This rendition comes with any one of two shades of yellow for the body and a blue or red tank in the rear. The Forklift's performance is, predictably, very poor. With low power, front wheel drive and rear steering, the Forklift moves at a snail's pace and possesses overly sensitive turning, to the point that sudden turns will pitch it violently to one side and frequently tip it over. In both GTA San Andreas and GTA IV, the Forklift is as slow as its fellow lower powered vehicles, the Mower and the Sweeper. 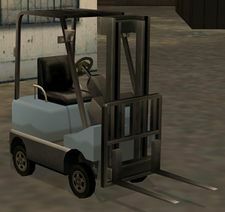 In GTA Vice City Stories, the forward speed of the Forklift is slower than even the player character's running speed; its reverse is actually faster than its forward motion. While being the slowest vehicle in GTA IV, that game's Forklift has the fastest acceleration of any vehicle in GTA IV (3.4 seconds to top speed), presumably to compensate for its negligible top speed of 29 mph (just over half that of the next slowest vehicle, the Ripley). The Forklift is used during the Robbing Uncle Sam mission in GTA San Andreas, with Carl Johnson loading boxes of firearms into a truck at a National Guard armory in Los Santos; it also plays a small role in the mission Breaking the Bank at Caligula's, when Carl Johnson must open the garage for Zero and the team during the bank heist with a Forklift. In the mission Gray Imports, gangsters in Forklifts loaded with explosives will attack Carl as he exits the warehouse. In the GTA Vice City Stories mission Boomshine Blowout, Victor Vance uses the Forklift to load Phil Cassidy's boomshine onto the latter's Walton before a factory blows up. In GTA IV, the default radio station in the Forklift is Liberty Rock Radio 97.8. There is one inside the Sprunk warehouse (the gunfight setting of Escuela of the Streets) at Bohan, though it can't be taken outside as the door is too small. There is a special yellow-colored Forklift used in the mission Breaking the Bank at Caligula's in Grand Theft Auto San Andreas. In GTA San Andreas for the PS2, the Ocean Docks spawning point has a glitch where almost at most times, the Forklift is spawned almost underground, leaving only the top of it's roll cage being visible. Easter Bay Chemicals, Flint County. Happiness Island, just off the boat wharf adjacent to Algonquin. Acter Industrial Park in Alderney, parked on the streets and around many buildings. Many Forklifts can be found in Port Tudor, Alderney. Sometimes on the small dead end near 8-Ball in Beechwood City, Broker. This page was last modified on 14 October 2013, at 12:34.